FAQ — Field's Tree Service Inc. Here are some quick answers to commonly asked questions. Why don't you want to top my tree? 1. My preference is always to attempt to repair the tree and re-establish a natural, structurally sound form. We are able to successfully repair a topped tree about 50% of the time. It is normally a multiple step process which will span over a number of visits and many years depending on the species of tree and how it copes with decay. The other half of the time, the damage has already become too great. Decay is often present at the old topping cuts and new, fast growing shoots which are both poorly attached and poorly tapered (way too long and skinny) are growing from a place where decay is spreading. If repair is not an option, then we sadly come to one of the following, less desirable options. 2. Remove the tree and hopefully replant with a more suitable species in the correct place. 3. Re-top and monitor. This option is necessary when the tree has too much value to the client to be removed and they are willing to spend the money to maintain the tree as long as possible. As a person who has spent his life dealing with trees, I fully understand how valuable they are and I am always willing to go to lengths to retain and care for trees. Re-topping is something I like to avoid as often as possible because I don't want to perpetuate this terrible practice. The more often people see trees being topped, the more they think it is a normal, acceptable thing to do. Yes. Actually, we give firm quotes for our services which are valid for 60 days. An estimate is a price that may be changed. Our price will not change unless the scope of work changes. There is never a fee to have us come out and quote on a job. There is a fee for a consultation with a qualified Arborist to assess the health and safety of your trees, to create a written report for the purpose of obtaining a tree removal permit, or to create a tree management plan. Here is a basic fee structure but please contact us for a more detailed description of cost. $100 plus GST for a Verbal, informal assessment with a site visit limited to one half hour and no climbing, digging or coring to form our assessment. $120/hr for all other consulting services. The amount of time required to assess and create a report varies greatly. The scope of work is defined by the client's needs. We are often able to give a rough estimate for budgeting purposes after discussing the details. Aerial inspections, root crown inspections, tree maintenance plans and impact assessments available. Am I allowed to remove a tree? 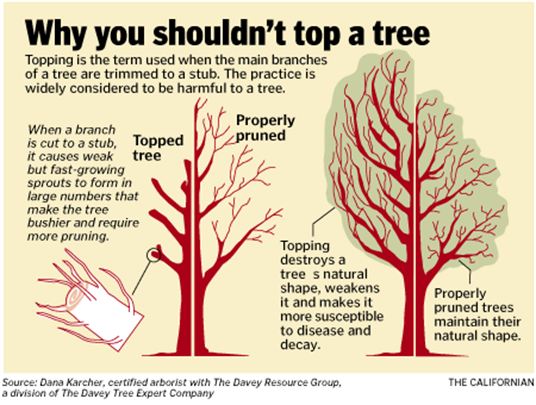 There are different rules in different municipalities when it comes to tree removal and even tree pruning. We have created the "RESOURCE" page of this website for our customers so that you can find the tree bylaw and/or permit application for your city or municipality. This resource is for your convenience only. All of the files came from the respective city or municipality's website, so we assume they are accurate at the time we posted them but we take no responsibility for the accuracy of these documents. Please don't rely on this as your only source of information.